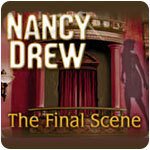 Nancy Drew: The Final Scene Game - Download and Play Free Version! Thwart the Kidnapper in This Riveting Detective Adventure! "Listen carefully: If they knock the theater down, the girl goes with it." Nancy Drew has decided to take a much needed vacation and travels to St. Louis with her best friend, Maya. The girls are excited at the prospect of interviewing the dreamy Brady Armstrong, star of the new movie "Vanishing Destiny." The movie is set to premiere at the old Royal Palladium Theater which is scheduled to be demolished in three days, making "Vanishing Destiny" the last film to ever be played on that historic silver screen. Nancy heads to the concession stand while Maya starts interviewing the actor. A scream alerts Nancy that her friend is in danger, but the girl detective arrives at the scene too late. Maya is nowhere to be found, and a sinister phone call confirms that the girl is in serious danger. 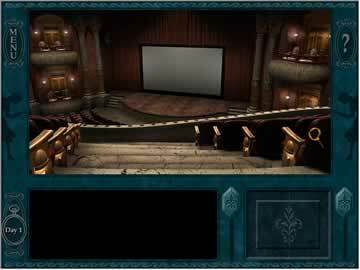 The girl's fate is tied to the Royal Palladium Theater, and if the theater goes down, Maya goes with it. It's a race against the clock for Nancy Drew, and there are many people who could be involved in her friend's disappearance. Will Nancy find Maya in time to save her? This game has a well crafted story with lots of depth and length, making it a worthy companion to the beloved book series. The twists and turns of the plot will stay with you long after the case is solved. It's a good thing that Nancy Drew never leaves home without her trusty magnifying glass! Try your hand at exploring the world, detective style. Use the magnifying glass to search the environment for interactive objects and clues; the magnifying glass turns red when placed over an area of interest. Clicking will bring you in for a closer look. Moving around is easy too. When the magnifying glass cursor turns into an arrow, simply click to move in that direction. Items can be gathered in the inventory for use later on in the story, so keep an eye out for anything that could come in handy later. This game has junior detective and senior detective modes, adding replay value and making this title suitable for multiple skill levels. In addition, there is a second chance button that comes in handy if you happen to make the wrong choice in a situation. Second chances must be used wisely, so be careful. If you're a puzzle fan, you will delight in the amount and variety of puzzles contained within this game. Be prepared to take lots of notes as you make your way through the story! Nancy Drew: The Final Scene doesn't force you to find clues in a step-by-step, linear manner. This makes playing the game feel more realistic. If you're tired of accidentally triggering dead ends by discovering clues and objects out of sequence, this is the game for you. The voice acting in this game is excellent, and the soundtrack fits nicely with the underlying movie theme of the title. Big band and jazz style sounds set the stage for a mystery to remember, and suspense style musical scores will keep you on the edge of your seat throughout the gripping gameplay. All of the characters in Nancy Drew: The Final Scene have complex and well rounded back stories, making them dynamic suspects that will keep you guessing until the very end. Since each character has a reasonable motive, it will take lots of clues to get to the bottom of this case. 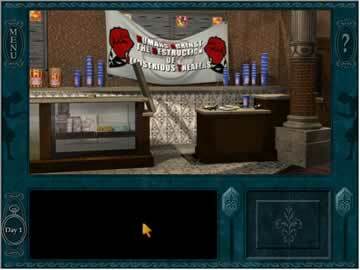 Nancy Drew: The Final Scene is a game that will appeal to both fans of the book series and newcomers alike. If you enjoy getting to the bottom of a good mystery, this is the game for you!